HomeHow toHow to make Password Protect Page in WordPress ? 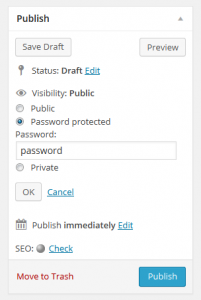 We can apply Password protection to WordPress posts and pages. 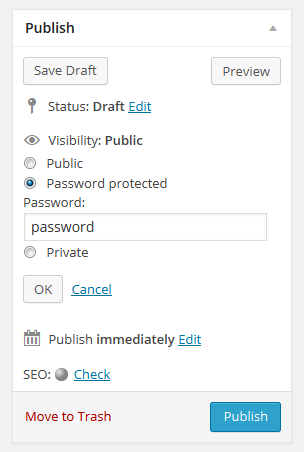 There is a built in option in WordPress for Password protection. 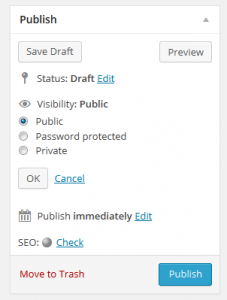 Once We publish a WordPress post (or Page), it will be public by default. Public is selected by default. When we checked the Password protected radio button the text field will be shown below for entering a password, The password limit is 20 characters max, After entering password click the “OK” button. Now post’s new setting, e.g., Visibility: Password Protected.